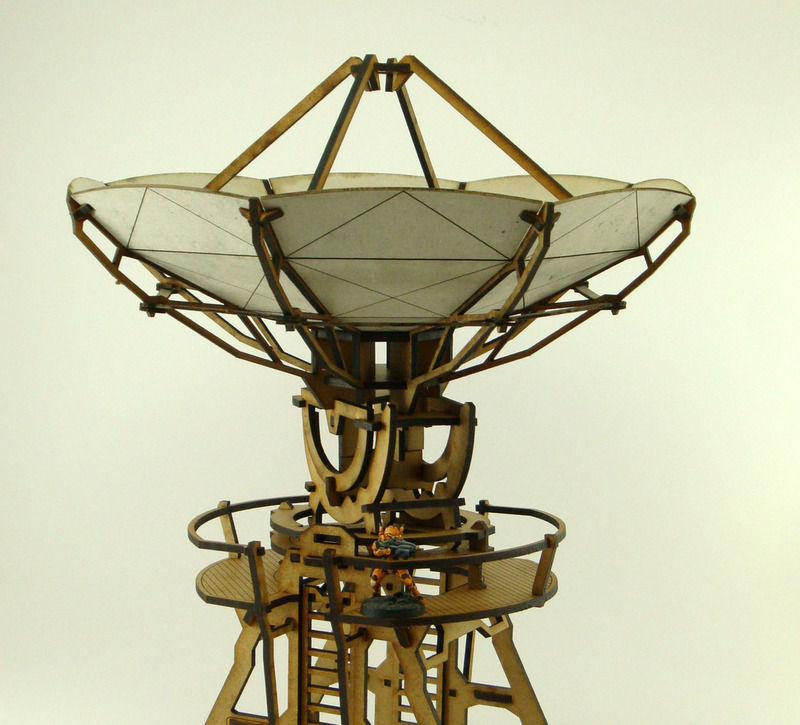 Many feel that Nikola Tesla was ahead of his time, possibly even from the future. He certainly pushed the boundaries of science for the time. So it seems only fitting that a game bearing his name is doing the same. 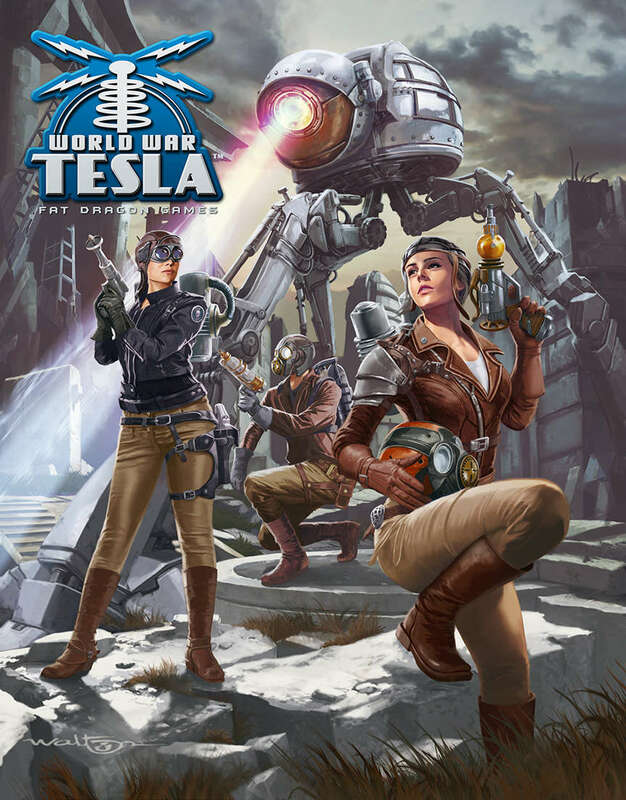 Fat Dragon Games has released World War Tesla, their new 15mm miniatures game. You can download the whole game, print it out and play it. That includes the minis. Yup, the whole game is download and printable. You just need yourself a 3D printer. The work week continues along. We're in that second-half slide towards the weekend. And I'm excited for it, since I've got a great weekend lined up. My new gaming mat should be here today or tomorrow, and I've got lots of baking to do. I mean, what could be better? Nothing. That's what. 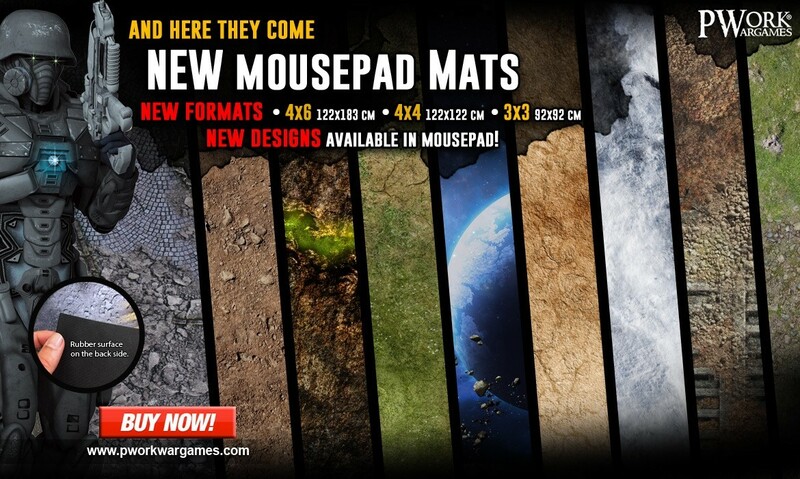 Speaking of gaming mats, let's get your gaming tables looking as good as possible. 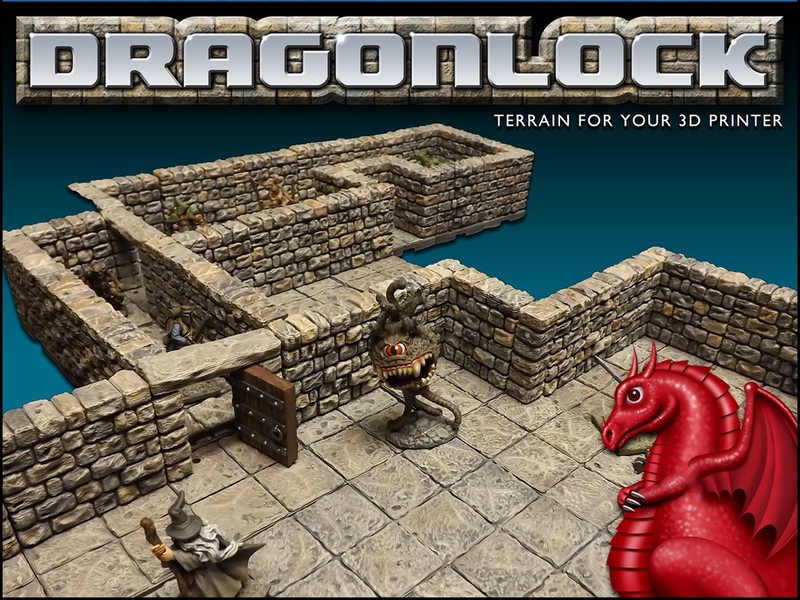 Today in the Terrain Corner we have: New Unlocks and Stretch Goals Posted For Dragonlock 3, StudioLevel Terrain Coming To Kickstarter, and Heroic Maps - Storeys: Harwenna's Tower Available Now. And here we are, back at Monday. Thinking back, this is the first Monday in the last 3 that I've been at the office. Last week was the storm, and the week before was Labor Day. My Monday shirts got a bit of a vacation, I suppose. But they're back it today, and that means getting your gaming tables looking good. Today in the Terrain Corner we have: Final Days for ESLO Terrain Printable Ships Kickstarter, New Mousepad Material Mats Available From Pwork Wargame, DRAGONLOCK™ 3 Kickstarter launches September 19th, Dungeon Box RPG Scenery by Custom Terrain Up On Kickstarter, Normandy Church Terrain Available From Tabletop-Art, Forge Prints Running Adventurescapes Kickstarter, and Heroic Maps - Storeys: Pyramid of the Sun Priests Now Available. Back in the office on Monday and Devo's telling me about workin' in a coal mine. Now, obviously, running TGN is nothing like actually being in a coal mine. First, I'm at a desk, typing news stories instead of swinging a pick-axe. Next, I'm in very little danger of getting Black Lung. Third, while I'm sure many coal miners do enjoy what they do, it's probably not the same extent that I enjoy what I do. But Mondays are still Mondays. Let's try and think about a weekend of gaming ahead, and making those gaming tables looking as good as possible, eh? 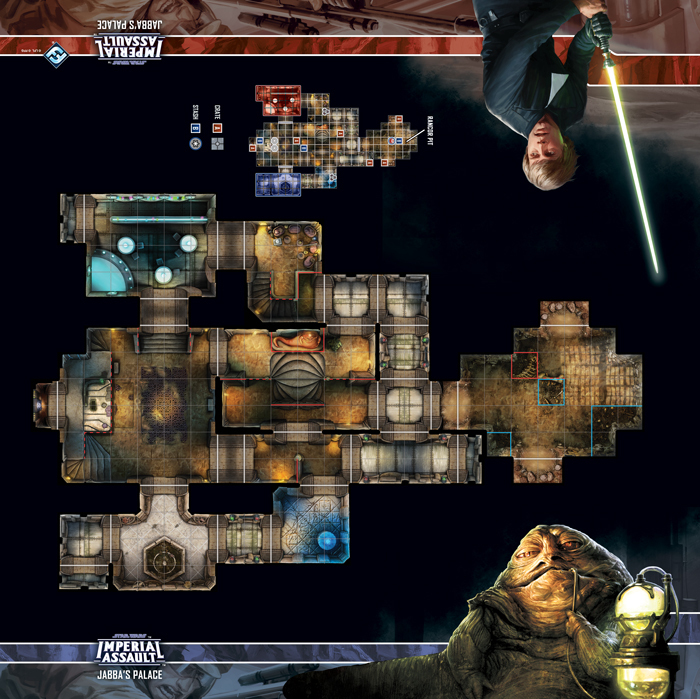 Today in the Terrain Corner we have: Jabba's Palace Map Available For Imperial Assault and Fat Dragon Games Offers Free 3D Models With Newsletter. I hope everyone is having a good time with some sweet treats and scary movies. And, hey, it's another chance to break out your convention costumes, too! Bonus! Anyway, let's make your gaming tables look good, shall we? 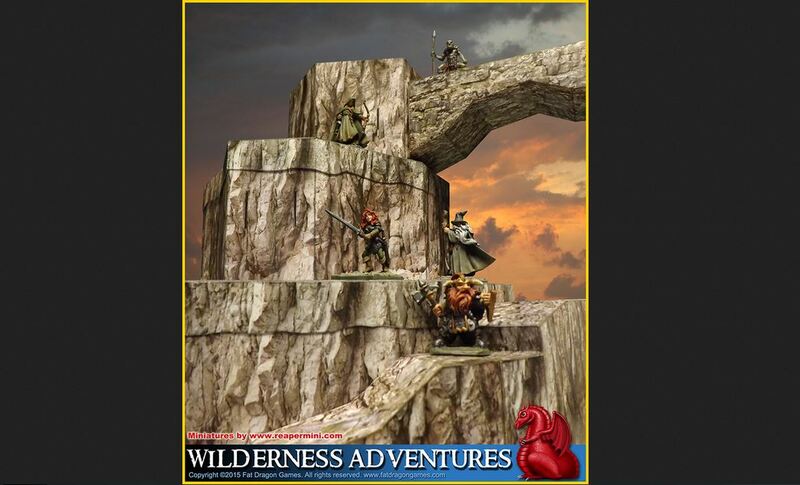 In the Terrain Corner today we have: New Age of Sigmar Battle Mat From Games Workshop, Rocket Pig Games Running TileScape Dungeons Kickstarter, Dragonlock Ultimate Free Sample Set Now Available, and Adventure Tiles - Wilderness Tabletop RPG Terrain System Up On Kickstarter. You know... I could've sworn that I put a weekend here just a minute ago. Really, my weekend went by ridiculously quick. For example, on Friday, I blinked and suddenly it was 1am. Then Saturday went by in a flash, as I did some more baking before heading to a friend's party. Sunday was spent cleaning up the apartment some. And now I'm back here in the office. Ah well, hopefully I'll blink and it'll once more be the weekend. In the meantime, let's make sure your gaming tables look as good as possible. We have: Brigade Models Release New 10mm SF Buildings, Free Lars Homestead paper model, Manorhouse Workshop Update #6 – Hard Plastic - Flooring up & Zealot Miniatures, Pwork Wargames Urban Sector Sci-Fi Mat Now Available, Fat Dragon adds giant Orcus figure to Dragonlock 2 Kickstarter, and Heroic Maps - Halloween Sale and New Maps. So, my weekend was filled with gaming and cooking. For gaming, on Saturday we played some Ascension, some Dogs of War, and some Ninja Camp. We also talked a bunch about a 5th edition game coming up. As for cooking, I made two batches of dark chocolate brownies (one with white chocolate chips and cayenne, the other with pecans, coconut, and caramel), caramel (yes, I make my own caramel), and Mountain Dew ice cream (honestly). What sort of stuff did you get up to? Oh, and being Monday, we have our Terrain Corner. Quick one today. 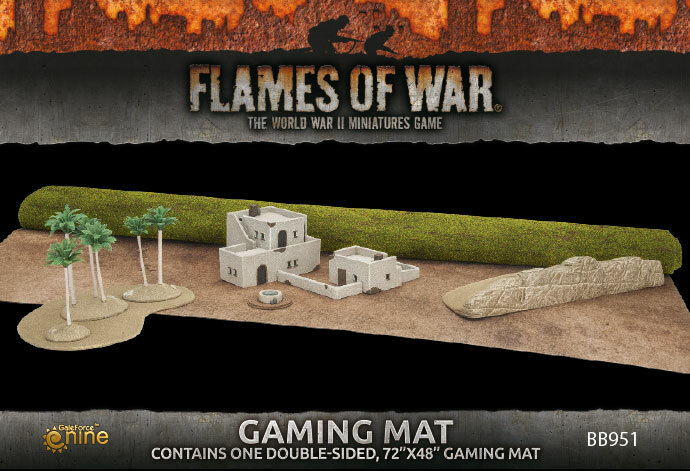 We have: Frosty Plain: Pwork Wargames Gaming Mat Now Available and Fat Dragon Games' Dragonlock 2 Kickstarter adds Market and Sewers sets. The work week continues on. As we make our way towards the weekend, the mind turns to gaming (at least, mind does). And seeing as much of the time, that gaming takes the form of a minis game or an RPG, it also means I'm thinking about terrain. You want your tables to look good, right? Right! So let's help with that. 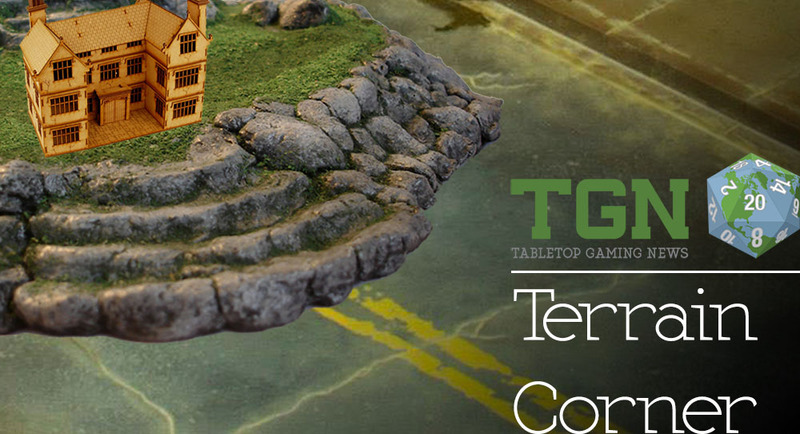 In today's Terrain Corner we have: New releases from Terrakami Games, New Badlands Terrain From Angry Mojo Games, Dragonlock 2: Fantasy Village Terrain Up On Kickstarter, and Dust Town: Pwork Wargames Fantasy Gaming Mat Now Available. At the moment, though, we've got some stories to make your gaming table look as good as possible. It's time for another Terrain Corner. 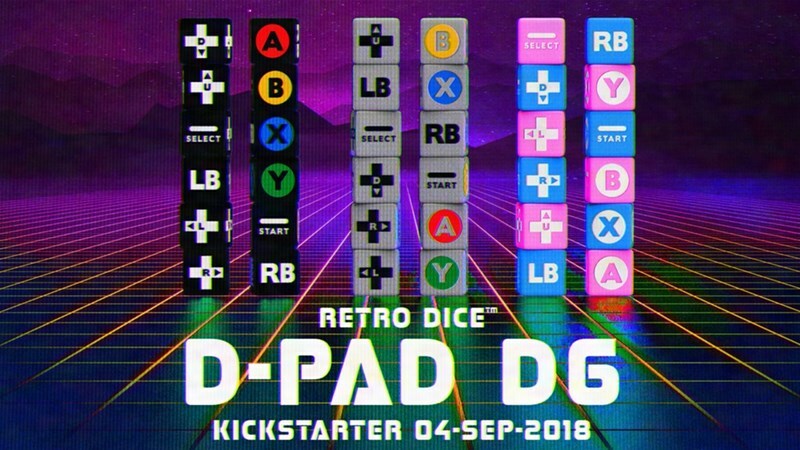 Today we have: Chaos Factory Fantasy Sports Accessory/Field Indiegogo Campaign Running Now, Scenery Dice are now available, and Fat Dragon adds 'snap-lock' cave terrain to Kickstarter. 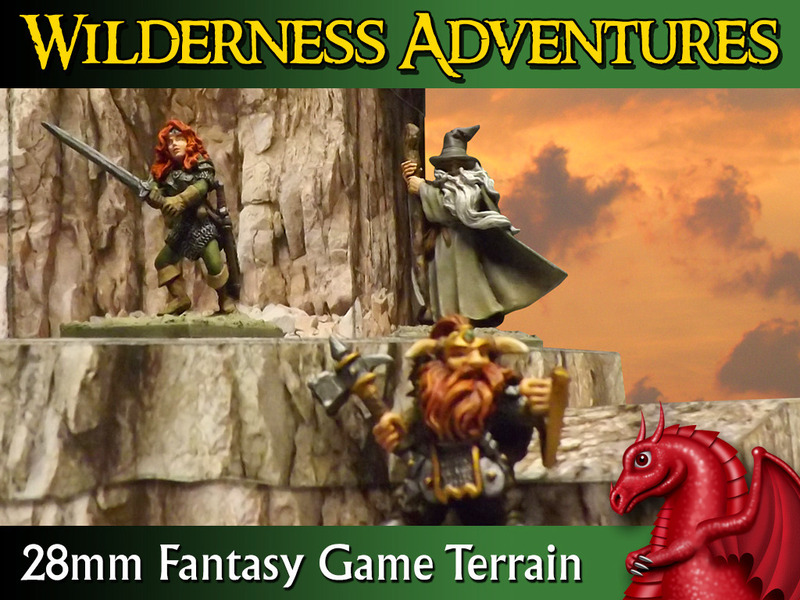 Fat Dragon Games has made it through quite a few stretch goals in their Outdoor Terrain Kickstarter campaign. They're adding more models to the pledges as well as more add-ons. They've got tie-ins with Frog God Games as well to check out. 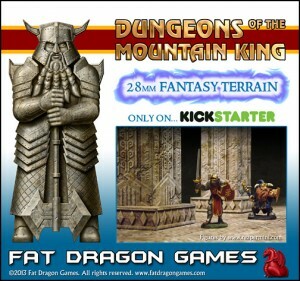 Fat Dragon Games launched their Kickstarter campaign for their latest set of terrain. This time it's Wilderness Adventures (and for some reason, that reminds me of the campground in National Lampoon's Vacation... not sure why. They have nothing to do with one-another, but there we are, then). More than just trees and rocks, there are cliffs, temples, statues, and more. The campaign is already more than 13x funded with still 33 days to go. So there's plenty of stretch goals and extras to check out. 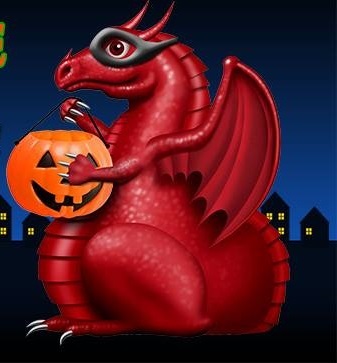 Fat Dragon Games is having a sale on all their products over on RPGNow in honor of the spooky season. Fat Dragon Games is showing off artwork for their steampunk stretch goal rewards as part of their Ravenfell Kickstarter campaign. There's a week left, so you've still got some time to jump in on some inexpensive terrain. Fat Dragon Games' incredibly popular Ravenfell Kickstarter has just hit $37,000 and has unlocked TEN additional free bonus model stretch rewards. 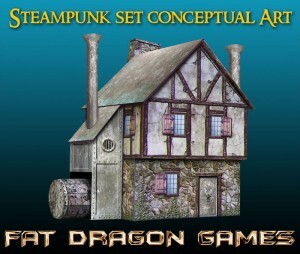 Among the stretch rewards coming up is a steampunk accessory set to convert the village to a steam setting. Fat Dragon Games has a Kickstarter campaign they just launched for a new terrain line called Ravenfell. They've made more than 13x their goal already. So it's stretch goals for 32 days. 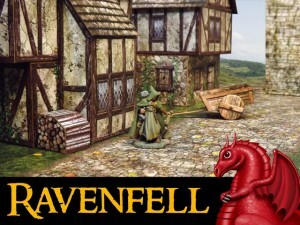 RAVENFELL features our exclusive FOLD-FLAT terrain system which allows you to create fully modular 28mm scale village buildings for your RPG or wargame. The buildings are comprised of separate, stackable components, which can be mixed and matched between models for even greater variety, and folded flat for easy storage. 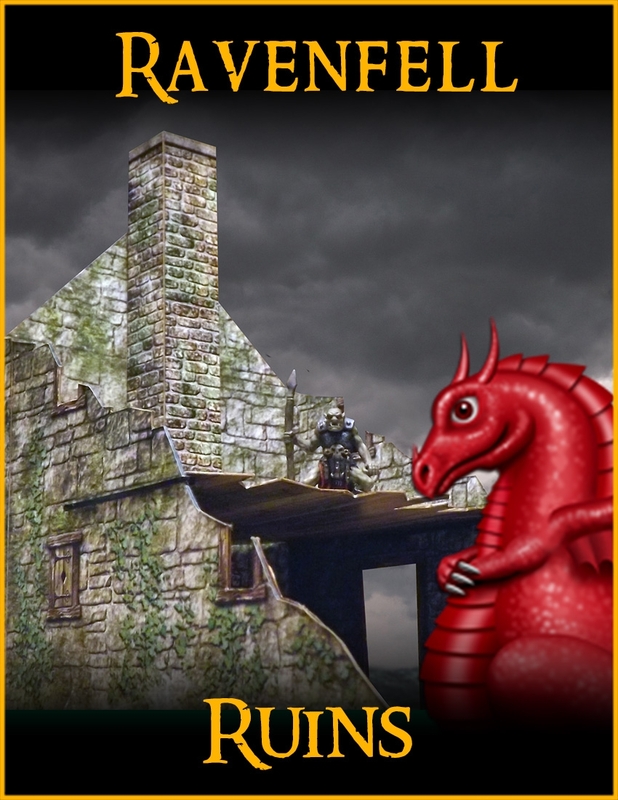 Each village set is delivered in a downloadable PDF format via our online distribution partner DriveThruRPG.com, and once you have the set you can print and build as many pieces as you like and never run out or need to purchase more. Additionally, our graphic layer options allow you to customize your building to suit your tastes. 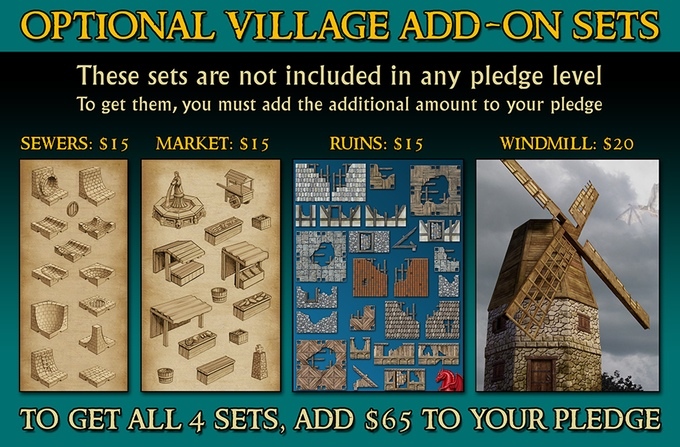 This new village set is the culmination of nine years of terrain design experience, combining the best features of our previous sets such as modular components to mix and match, 2D interior tiles (now removable and swappable for maximum versatility) and fold-flat major components, creating the ultimate fantasy village terrain series! All sets include a 1" grid and grid less texture options. Fat Dragon Games has a new Drow Dungeon paper terrain set available to help spice up your tabletop. 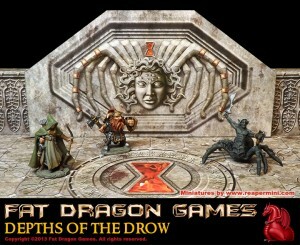 Fat Dragon Games has just released a 28mm scale Drow themed terrain set for 28mm fantasy games. 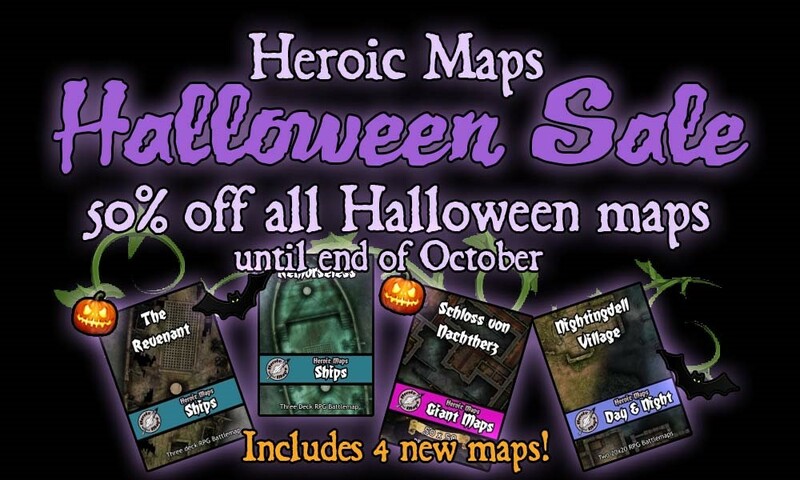 This set includes a fully detailed dungeon, props, giant spider, and bonus cavern pieces. 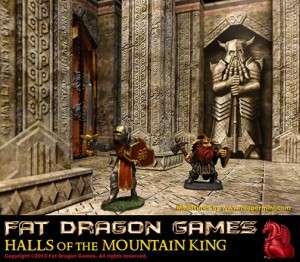 Fat Dragon Games has a new Dwarven Halls terrain pdf available to help enhance your tabletop gaming experience. 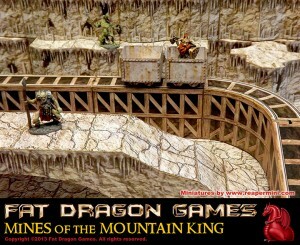 Halls of the Mountain King is the first release of Fat Dragon Games' unprecedented epic dwarven citadel terrain series. 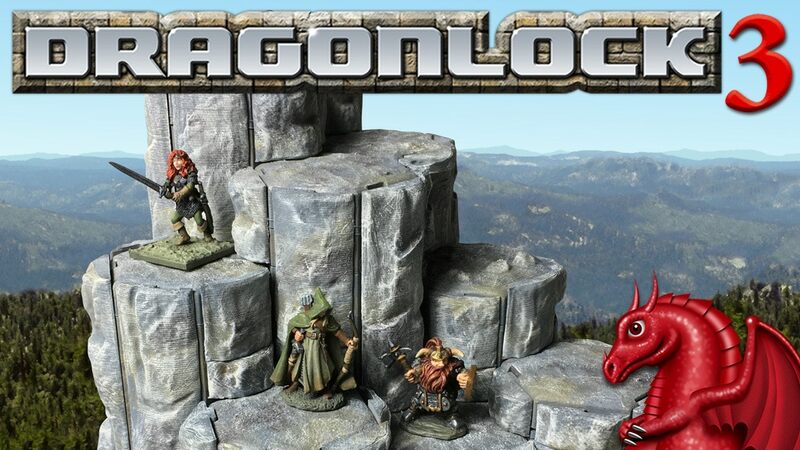 The E-Z LOCK terrain system allows you to create fully modular 28mm scale terrain layouts for your RPG or wargame, in a downloadable PDF format, and once you have the set you can print and build as many pieces as you like and never run out or need to purchase more. Additionally, our layer options allow you to customize your terrain to suit your tastes. This new PDF terrain set features our exclusive modular E-Z LOCK terrain designs, allowing you to disassemble and easily store your designs between games. 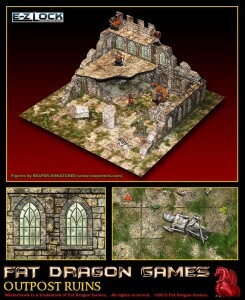 Fat Dragon Games has a new terrain set available: Outpost Ruins. 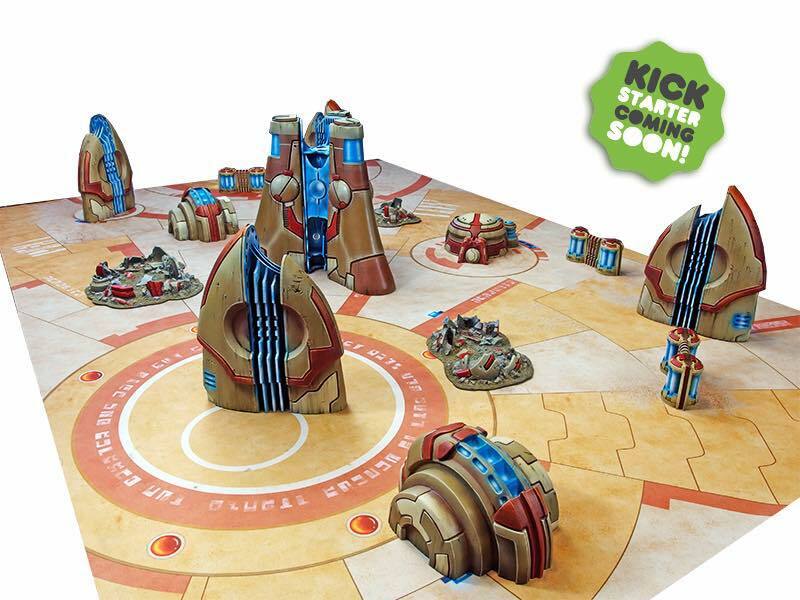 Fat Dragon Games has released their latest terrain set OUTPOST RUINS. This fully modular kit can be used to create medieval ruins in almost any design desired.